A charming little stop for conversation and delectable goodies. you’ll love the coffee presentation. Owner Patrick Flanigan named Carmel’s for his mother, who was quite a character, and “would have loved this place.” He said he used to haunt another Phoenix coffee shop every morning before work as a TV weatherman and media salesman, studied coffee roasting, and always wanted to own a coffee shop. Three years ago, in 2011, his dream came true when the current location — a cozy, urban vintage 1940s house –became Carmel’s home. I love me a beautiful patio! Actually, I loved everything about this friendly place, even the unique art used to identify the stair steps. 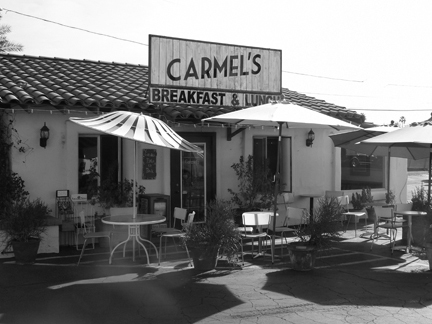 Carmel’s specializes as a venue where people actually talk with one another. Here, conversations range from arts and humanities to sports and family…the gambit of life experiences. Yes, you may access a free wi-fi connection, but your fellow patrons typically aren’t staring at computer screens, they’re building relationships. M–Su. 7 a.m. to 3 p.m. I saw a friend’s Facebook “check-in” at Black Cat and thought I ought to go check it out. This place did not disappoint. The owners’ community spirit encouraged me. 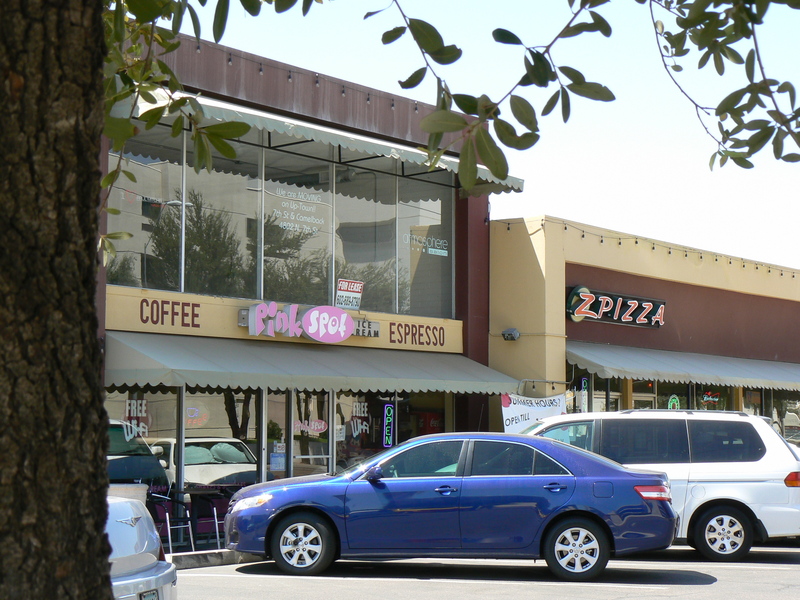 Black Cat is a member of Local First Arizona, so they support other local businesses. This contributes to a more thriving Arizona community and economy, and that makes me happy. Plus, they support local schools and educators, whenever possible. Noble and kind, as well as solid coffee purveying. Nice. I found one male barista especially considerate and helpful. Cheers, m’man! Every day of the year from 6 a.m. to 10 p.m.
Watch, in the coming months, for a new patio renovation to allow more outdoor seating at Pink Spot. Uh … coffee, tea AND ice cream! What’s not to love? Fresh food, made to order, and inexpensive. The staff provides input on everything they do, from ice cream flavors to sandwich types. When the space next to their healthy, organic Zpizza location opened up four years ago, former attorney Julie Kossak and hi-tech sales exec Mark Wheeler got excited to bring something unique to the downtown Phoenix Willo District where they live and work. The husband and wife team considering what type of place was missing in the neighborhood and decided it was ice cream. Oh, and what goes great with ice cream all day long? Coffee! And, what do people need with their coffee? Yummy food! The name originated with their daughter’s love of the color, and represented the fun, happy ambiance they hoped to create. Vîola! Pink Spot was born. 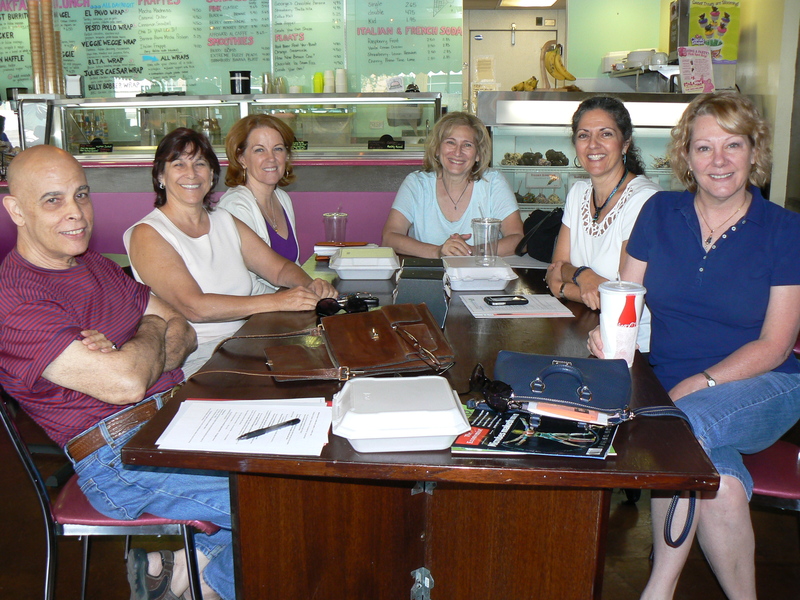 My ALWAYS authors tribe met at Pink Spot this month for a lively discussion about Deep Point of View: Eduardo Cervino, Raleigh Pinsky, Andrea Beaulieu, Erana Leiken, Ann Videan, and Kris Tualla. – Hand made from Karen Kreamery especially for Pink Spot, the gourmet, super premium (16% butterfat) ice cream includes 16 standards like chocolate, mint chip and coffee. But you can also go adventurous with a few unique rotating flavors like pear and Gorgonzola, or lavender. – Now, don’t forget the special pizza next door, either. I have one tiny issue with the noise level if you’re planning to have a meeting or serious conversation there. But, overall, the location is delightful. It’s definitely a comfy, party environment. M–F: 7 a.m. to 9 p.m. Sa.–Su. 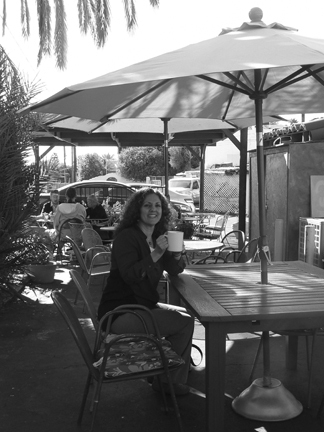 : 8 a.m.to 10 p.m.
Souvia is probably my favorite independent teashop in the Phoenix area. I love it mostly because it’s dedicated only to delicious tea. Surrounded by 120+ premium loose teas and tisanes (herbals) from around the world, and knowledgeable baristas to help you understand all their nuances, what’s not to love? I find the store small, but comfortable, and a very relaxing respite from the daily GRIND, if you’ll excuse my pun. 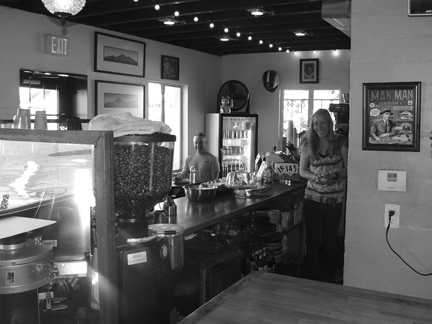 Owners Bret and Kerstin Wingart explain on their Web site that the idea for their shop came to them in the spring of 2004 while hiking in the Maverick Mountains south of Prescott, Ariz. Based on their initial plans that day – plus research, and inspiration from tea room and retail establishment visits in Germany, Austria, China and Japan – the Wingarts opened their store on Jan. 7, 2006, in Phoenix. The name Souvia is a combination of two partial words. “Sou,” from the word “soul,” reflects the belief that tea and its traditions are good for one’s soul. “Via” the Latin root for “the way,” and the last part of Kerstin’s middle name, also fit. 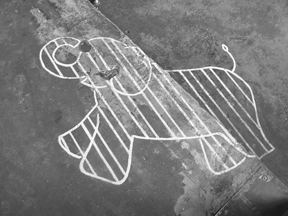 Therefore: “Souvia,” representing the soul of Olivia and the way of tea. Very nice. This wordsmith approves. 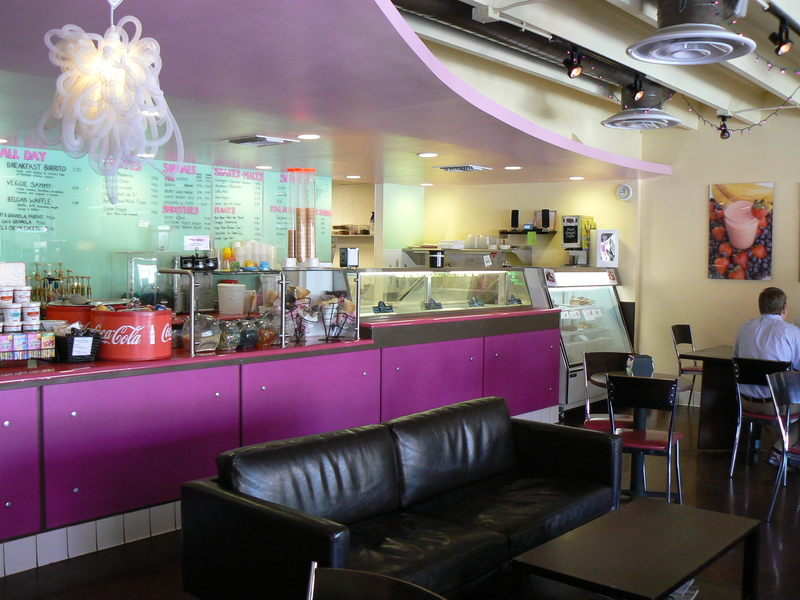 The focus is strictly on custom-brewed teas here, so you’ll find only a few goodies and snacks. My Almond Dream brew, which tasted like a freshly warm oatmeal cookie, beautifully complemented the deliciously chewy chocolate chip cookies I shared with my friend Andrea. 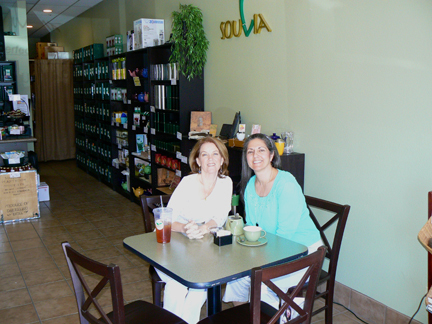 Andrea Beaulieu and I enjoy great smells, tastes and camaraderie at Souvia Tea in Phoenix. Thanks to our barista for snapping this shot. I only wish Souvia was not 45 minutes from my home in Mesa! 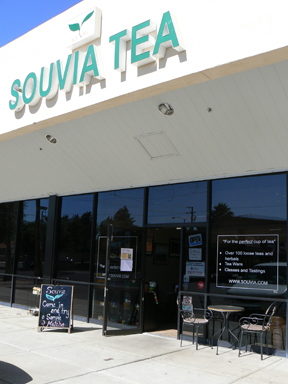 Souvia offers informative, customized tea seminars and tastings. They host private events, too. They sell gifts and accessories to help you brew the perfect cup of tea. 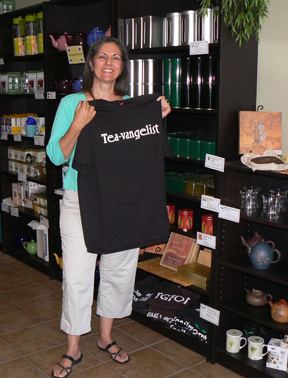 The owners are members of the USA Specialty Tea Institute, and their training and dedication to the craft certainly shows. Sat. & Sun., 8 a.m.–4 p.m. 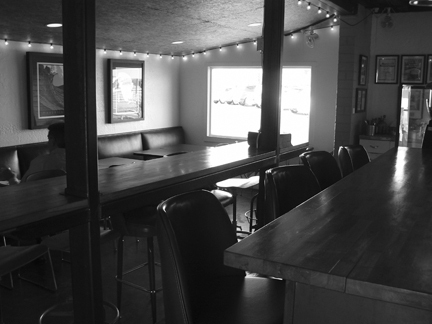 Walking in, I immediately liked the décor and the feeling of the place, especially as a quiet spot for conversations. I ordered a savory crepe with vegetables and feta, which was very tasty. I know some people adore that lightly sweet crepe flavor, but I just have a hard time thoroughly enjoying it with salty foods. So, when I took my daughter Codi to Cupz N’ Crepes for brunch and to take photos, I tried a salad. Deliciously fresh! Next time, I’ll try a sweet crepe like honey, bananas and almonds. Yum! I see why this coffeehouse was voted one of the best new business venues in Ahwatukee, and best for breakfast and customer service. 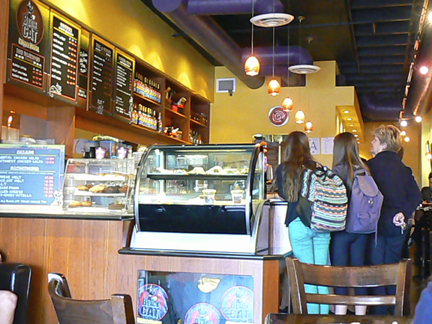 The vibe at Cupz N’ Crepes, both times, felt energized and positive. A flow of people came in to order to-go drinks, others sat and enjoyed conversations over their cups and crepes. I can imagine a group of writers or musicians sitting on the couches in the back to share creative ideas and lots of laughs. The environment is clean and pleasant. I’ll definitely go back.